Imagine hiking through a forest. 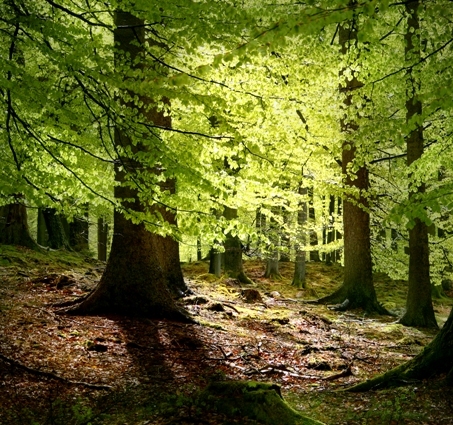 Tall, green trees provide shade from the sun. Squirrels and other animals chatter around you. You walk through a small stream and shiver as cool water runs between your toes. Now, imagine not being able to take a walk through the forest because it has been cut down, and it’s not just the forest where you live but everywhere. Deforestation is the clearing of large parts of our forests for human needs. Much of Europe, Asia, and North and South America were once heavily forested. For centuries, we have been cutting down these forests, but it is only in the past 50 years that we have been able to see the result clearing our forests is having on the planet as a whole. It is estimated that about half of all of the forests in the world have been cut down. Deforestation is worse in the tropics, where it is estimated that 100,000 square kilometers of forest are cleared every year. Scientists estimate that we will lose all of the tropical rain forests within 100 years if the rate of deforestation in certain areas continues. The forest isn’t just a pretty place to take a walk. Forests are home to many plant and animal species. Some plants need the deep shade the forest canopy provides to grow. Wolves, bears, cougars, moose, foxes, and countless other animals call the forest their home. Tropical rain forests alone are home to more than half of the world’s plant and animal species. That’s not bad for a type of forest that makes up less than 10% of all forests in the world. Forests also provide many helpful things for humans. It is hard to list all of the things we get out of the forest: Resins, incense, medicinal plants, and wood for paper and furniture are just a few of the things the forests of the world provide for us. Some people use forests for food, whether through hunting or foraging for edible plants, berries, and nuts. Tree and other plant roots help to keep the soil in place when it rains and reduce the chance of mudslides. We are losing our forests for many reasons. Agriculture is the largest contributor to deforestation around the world. Huge sections of forest are cut down to make room for industrial cattle ranches and large plantations. Small farmers in some areas slash and burn forests near their homes to make room for livestock or to plant crops. When these small plots are unable to provide food for their animals because of overgrazing or the land becomes too depleted to grow crops, they burn down another section of forest and the cycle starts again. Farmers aren’t the only cause of deforestation. Illegal logging operations move deep into forests and begin cutting down trees to supply paper mills. Miners push into forests to take advantage of fresh mineral deposits, and the only way to get to those deposits is to cut down the forests sitting on them. Many countries are discovering that building roads through their forests to help connect isolated communities also brings in people and companies that use the road to move further and further into the forest, causing more damage. How Does It Hurt Our Planet? Forests are the lungs of our planet. All plants take in carbon dioxide and release oxygen, but trees are able to convert more carbon dioxide than a house plant. They are places where carbon dioxide is sequestered through photosynthesis. Tropical rain forests are very humid because of the water vapor they release along with the oxygen. When part of a rain forest is cut down, the humidity in the area drops, causing the remaining forest to dry. Scientists are starting to understand how cutting down the rainforest is affecting rainfall not just in the forest but thousands of miles away. Drying makes the ecosystem vulnerable to wildfires, which in turn destroy even more of the forest. Depleting our forests is also adding to erosion. Erosion occurs when rock or soil is worn away, usually by water or air. Without plants to hold the soil in place, valuable nutrients are swept into rivers and streams and carried to the ocean. The removal of these nutrients from the life cycle of the forest causes additional stress on an already damaged ecosystem. Many of the plants and animals found in forests are endemic, or only found in that particular forest and nowhere else on Earth. When we destroy their habitat, we drive these plants and animals to extinction. Every year, scientists find more species that we didn’t know existed in habitats that are critically endangered in large part due to deforestation. Some of these species may have medicinal properties that can be used to cure or treat diseases. The best way to fight deforestation is through conservation. Try not to waste paper (remember, that paper was once a tree). Start recycling, not just paper but cans, glass bottles, and plastics. Try to buy products made from recycled goods. Save electricity by not using lights during the day and remembering to turn off appliances like televisions when you’re not using them. Instead of asking for a ride somewhere, walk or take public transportation. Finally, there are tree-planting programs like those of the Arbor Day Foundation that need volunteers to help plant trees not just in deforested areas but also in cities like yours. National Geographic Overview on Deforestation: Read here for a good general wrap-up of what deforestation is. World Wildlife Fund: Deforestation: This page offers a lot of good information on the topic of deforestation. Deforestation: Facts, Causes, and Effects: Learn more about why deforestation happens and what effects result here. Forest Cover Loss in Indonesia, 2000-05: The Starting Point for the Norwegian Billion to Reduce Deforestation: Norway and Indonesia have signed a pact to work together to help stem damage caused by deforestation. What is Clearcutting? The Natural Resources Defense Council looks at what clearcutting is and how it damages the environment. Global Deforestation: Notes from a college lecture examine the causes of and remedies for deforestation. Solutions to Deforestation: Greenpeace is one of the agencies that has worked to fix the problem of deforestation. NASA Earth Observatory: Tropical Deforestation: NASA looks at the direct and indirect causes of deforestation. What is Deforestation? : Learn more about deforestation on this page. Environmental Defense Fun Fact Sheet (PDF): A document from the Environmental Defense Fund discusses a global policy to help cut harmful emissions caused by forest degradation. Encyclopedia of the Earth: Deforestation: What is deforestation? Study this topic here. Deforestation in Canada: The Facts: This Canadian government page looks at the subject of deforestation and its impact on Canada. University of the Western Cape: Deforestation Fact Sheet: Facts about this environmental topic can be found on this page. Deforestation Increasing in the Amazon (slide show): See the effects of deforestation in photos from The New York Times. Threats to Our Forests: This kid-friendly site explores the reasons why our forests are in danger. Brazil Gums Up International Agreement to End Deforestation: A CBS News article looks at an attempt to forge an international pact to end deforestation. Livestock’s Role in Deforestation: The U.N. Food and Agriculture Organization gives information about how livestock operations can harm forests. Global Palm Oil Demand Fueling Deforestation: Another reason why forests are cut down is for valuable tree-based products, such as palm oil, which is found in many commercial products. Major Forest Announcements at U.N. Climate Summit: World leaders have set a global timeline to end deforestation. Deforestation: Carving Up the Amazon: Road construction is another reason that people cut down forests.